The State of Montana requires that all animal bites be reported, and the Gallatin City-County Health Department receives these reports and coordinates follow-up with the victim and Animal Control to ensure that no further threat exists. Dog or Cat Bite…What Now? At the health department, we follow up with the person bitten to ensure they have received medical care and have an up to date tetanus vaccination. (Less than 5 years if the wound is deep, or less than 10 years if the wound is more superficial.) It is important to clean the affected area immediately after a bite with a follow up cleaning by a health care provider to prevent infections. Animal control is also involved. The animal control officer (ACO) will call the pet’s owner and the pet’s veterinarian to verify the last dose of rabies vaccine the pet has received. Because vaccines are not 100% effective, even if the pet is current on its rabies vaccines, it will be quarantined for 10 days (usually at home). At the end of the 10 days, the ACO will confirm that the pet has not developed any signs and symptoms of rabies. If the pet is not up to date with its rabies vaccine, it will also be quarantined for 10 days at the vet’s clinic or animal shelter. If a dog or cat bites you or one of your family members, make sure to get the owner’s contact information so Animal Control can follow up and verify the pet’s rabies vaccines or quarantine as needed. This critical step will help you and your primary care provider decide if you will need rabies post-exposure treatment. Cat and dog bites happen. ACO and the Health Department work together to ensure the person bitten receives the best medical care possible. 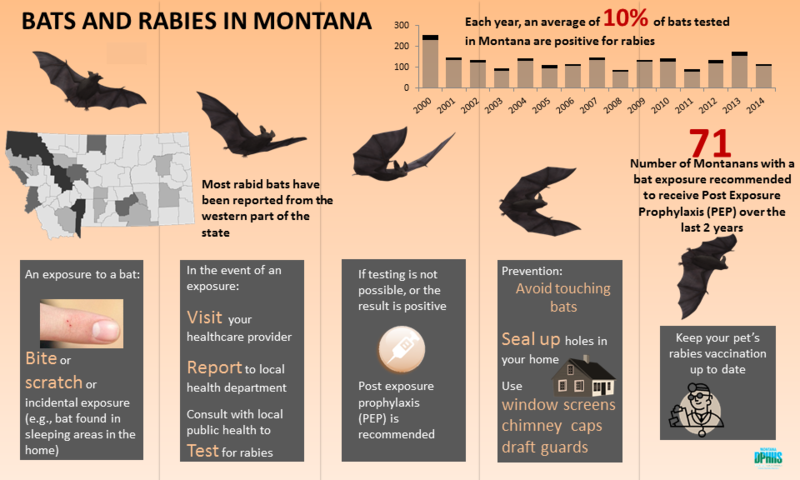 Rabies in pets is extremely rare in Montana, but we always want to be sure to rule out rabies in pets whenever a bite to a human happens. Questions? Call us at 406-582-3100. • And, if possible, bring the bat into a laboratory for testing. For more information about bats & rabies, check out this blog post.